Not exactly the cheapest book I’ve ever bought (£60 !!!) but probably the most enjoyable. 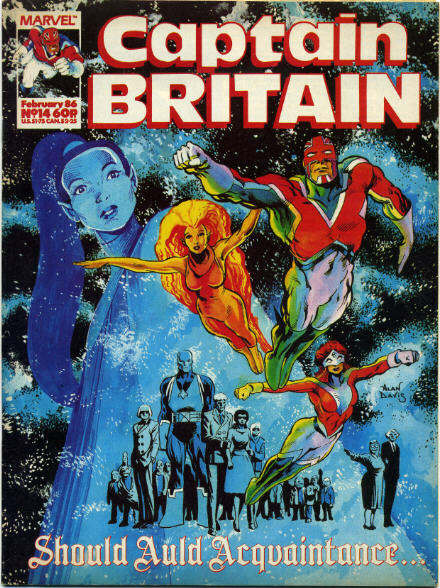 Captain Britain began in the mid 1970s as another identikit hero. His origin escapes me. Was he bitten by a radioactive hedgehog or did he find the sword Excalibur leaning against a tree?? I remember being underwhelmed by his pedestrian adventures in the first run of his title (overseen from the USA). However once he was being handled by writers and artists with imagination this great run of 47 stories from various 1980s UK titles are perhaps the equal of any superheroic antics before or since, including the late/great (soon to be resurrected) Marvelman. 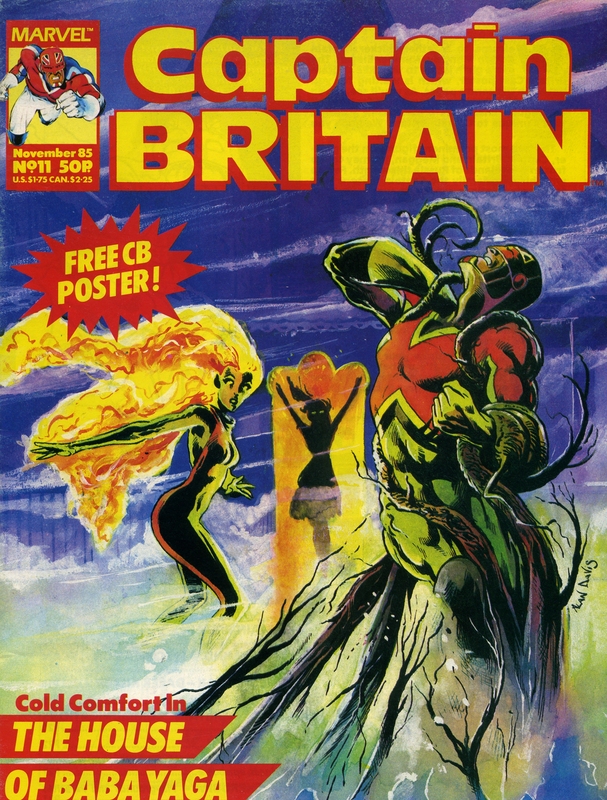 Perhaps if I’d got a week or so to spare I could have dug out all my original copies of these magazines featuring Captain Britain. They’ll still be around here somewhere. But it’s nice to have them all collected together in this one volume…and now in colour too……. Highly recommended. Oh, and if you click on the above image it might enlarge enough for you to make out the original comic covers in more detail. 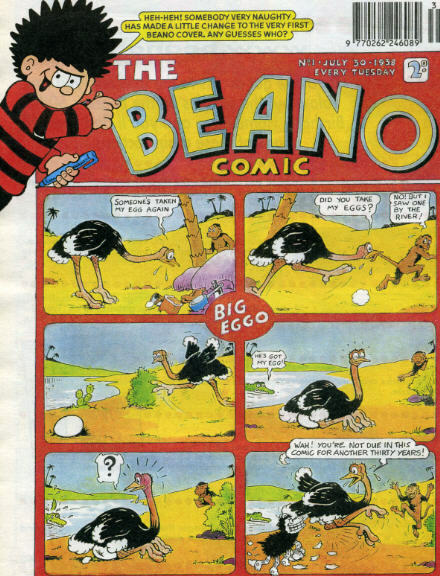 Once there were dozens and dozens of weekly comics catering for all age groups available in the average UK newsagents. All that remains is The Beano, The Dandy, 2000AD, Judge Dredd Monthly and the various (usually TV related) magazines for infants with titles like Thomas the Tank Engine and Shaun the Sheep. There might still be a Spiderman comic for youngsters also. 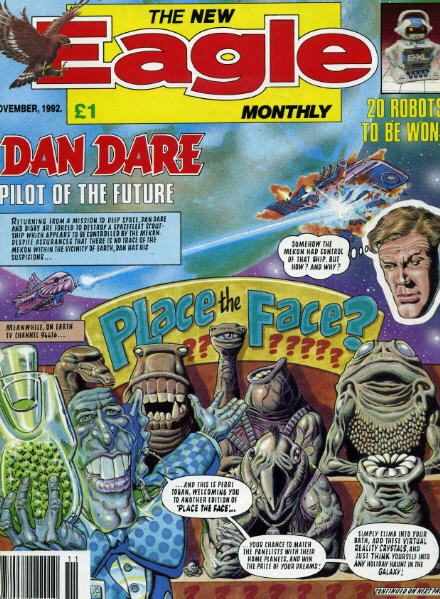 Yes there are other magazines like Dr who, Torchwood, Charmed etc etc but they are magazines with photos and articles and although they may contain an odd comic strip I don’t class them as comic books. Yes I know there are other publications (usually reprints only) such as DC Thompsons Classic Comics and Commando, and fanzines such as “Crikey” but you have to really search them out. They are not available at every corner shop. Yes, I know there are a dozen or so monthly books from Titan and Panini such as Batman, Superman, X-Men, Spiderman, The Avengers, Fantastic Four, Wolverine etc, but they are reprints also. Perhaps the current UK version of “Transformers” features some new stories but compared to the second half of the 20th Century the amount of new material in UK produced comics is now virtually zero. And yet it doesn’t seem so long ago that there was a thriving industry. 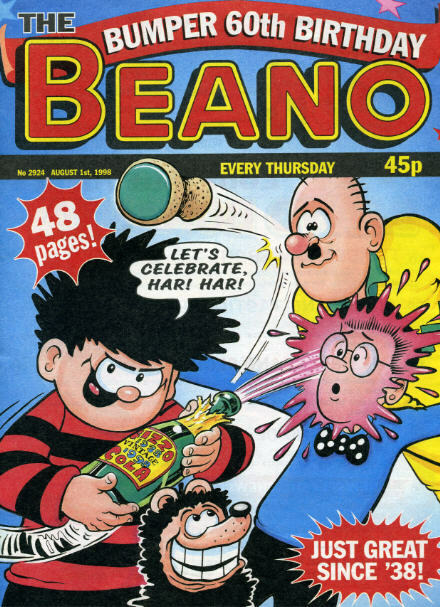 When The Beano celebrated its 60th birthday in August 1998 even adults who had purchased it as children in the 1950s through to the 1970s would have still recognised the characters inside such as Dennis the Menace and the Bash Street Kids.The back cover of this issue had a homage to the first ever issue from 1938. The Eagle had numerous relaunches over the years. Although it never managed to recapture the glory days of the early 1950s it was still available in the 1990s. The Eagle is no more but Dan Dare survives to this day. 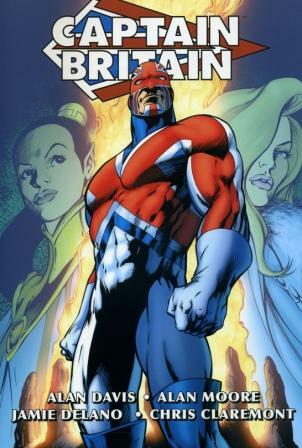 Captain Britain is another character that despite great art and stories never really became a household name like Captain Marvel/Marvelman before him. After featuring in his own weekly comic in the 1970s and cropping up in many other Marvel UK comics subsequently he finally received his own UK monthly. Sadly it only lasted for 14 issues. 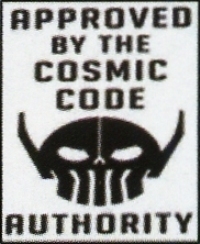 Happily he still appears in the Marvel USA Universe to this day. 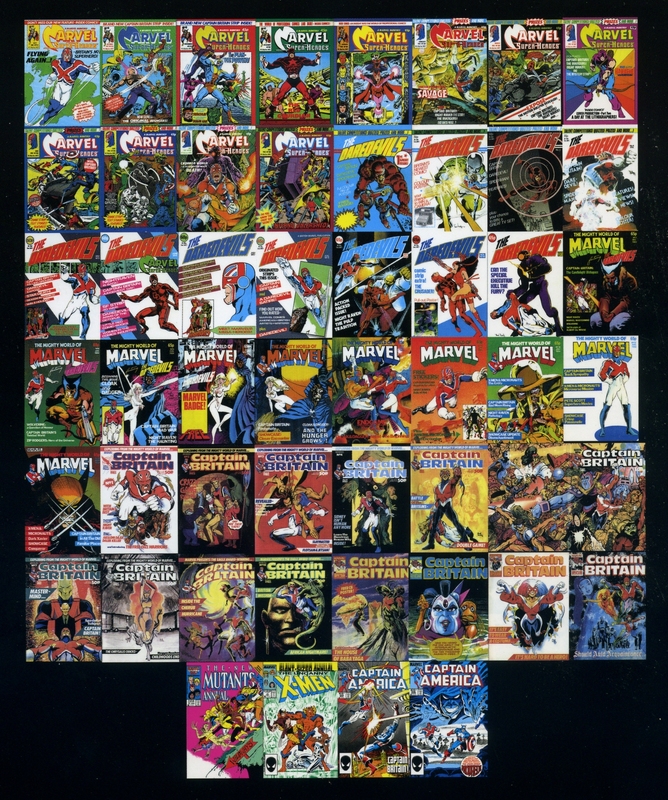 In the 1980s and 1990s there were a number of Adult Comic Books such as “Warrior”, “Heartbreak Hotel” and “Deadline”. 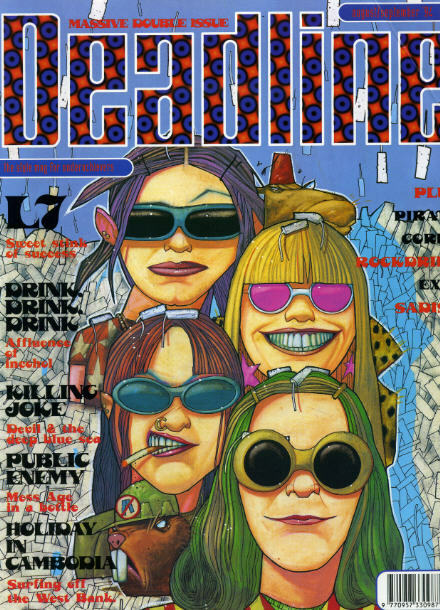 In its earlier days “Deadline” introduced the world to “Tank Girl” (and my particular favourite “Hugo Tate”). By the time No 64 appeared it was turning into more of a music magazine with added comic strips. It ended shortly after this issue. Oops I’ve just remembered one British Comic still being published today. Although “Viz” hasn’t the huge circulation it once had, it is still on the (top) shelves. Its “adult” content also contains affectionate pastiches of Beano and Dandy type comic strips of old. Although “Sid the Sexist” and “The Fat Slags” being all thats available today probably sums up just what the UK comic industry of the 21st Century has come to !! !